Mitte is the location of the Brandenburg Gate, the symbol of Berlin and of German division and reunification and undoubtedly the city's most famous landmark. After the wall came down this area formerly the centre of East Berlin and also the district closest to the western part of the city - quickly became a popular residential district for west Berliners. 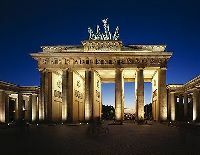 The area is full of bars and clubs and is popular with Berliners from all walks of life. It is what some would call downtown Berlin, and housing prices are rising fast as a result. The legendary Unter den Linden avenue, possibly Berlins most famous thoroughfare, crosses the area. Mitte is home to numerous institutional buildings and some important embassies (United States, United Kingdom, France, Russia) but also to the mythical Alexanderplatz and the capitals chic department stores. The Pergamon Museum, the Neue Museum and the Bode Museum are located in the famous Museumsinsel, a museum complex on an island on the river Spree. There is a vibrant clubbing scene on and around Oranienburger Strae, which is also the location of the synagogue and the centre of a growing Jewish community with a kosher restaurant and bar, a cultural centre and an evening school. There are unusual shops and elegant cocktail bars in and around the Hackesche Hfe, which also has some beautiful squares such as the Gendarmenmarkt. Numerous underground and overground lines converge at Alexanderplatz (U2, U5, U8, S3, S5, S7, S9) and at Friedrichstrae (U6, S1, S2, S3, S5, S7, S9), while many regional express trains also stop here too.